October 10 in Nizhny Novgorod on the site of the former market square "Elex-Polus" opening the plant for the conversion of commercial vehicles based on FIAT Ducato and IVECO Daily. The area of production capacity of the new plant is 30,000 square meters, including administrative and production facilities. The shop is equipped with modern facilities, including a two sprinkler cameras coating booth with a working capacity of 4 cars per day, modern ventilation system. 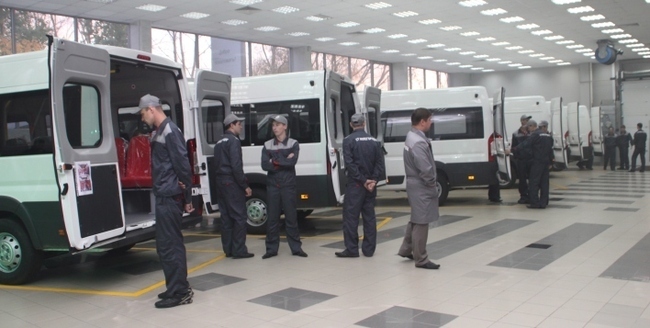 Capacity of the new company will produce up to 400 cars per month fifteen modifications: the bus for route transportation, travel, school bus, "ambulance", the vehicle for the provision of funeral services, etc. The first phase of production allowed to create 180 jobs. Purchase of all necessary equipment and repair cost of the production site of 300 million rubles. The new production is created on the basis of "ST Nizhegorodets." In the near future complex is ready to meet the needs of the Nizhny Novgorod region in comfortable vans, trucks, vans and special equipment, as well as significantly increase the supply to all regions of Russia.